This might sound a bit strange, but having a food blog, I often cook things that I’m not sure I’ll like. If I only ever cooked things I knew I’d love, this blog would soon turn into a macaroni cheese fest. These tikka mushrooms were one of the recipes that I wasn’t entirely sure about. The mushrooms are marinated in yogurt and plenty of spice, and then roasted… and, roasted yogurt? Yeah, that sounds pretty terrible. But! It works! It works so, so well! The yogurt almost goes slightly crispy round the edges (I know, crispy yogurt sounds about as appetising as roasted yogurt, but bear with me), and the juicy mushrooms go perfectly with the Indian spices. 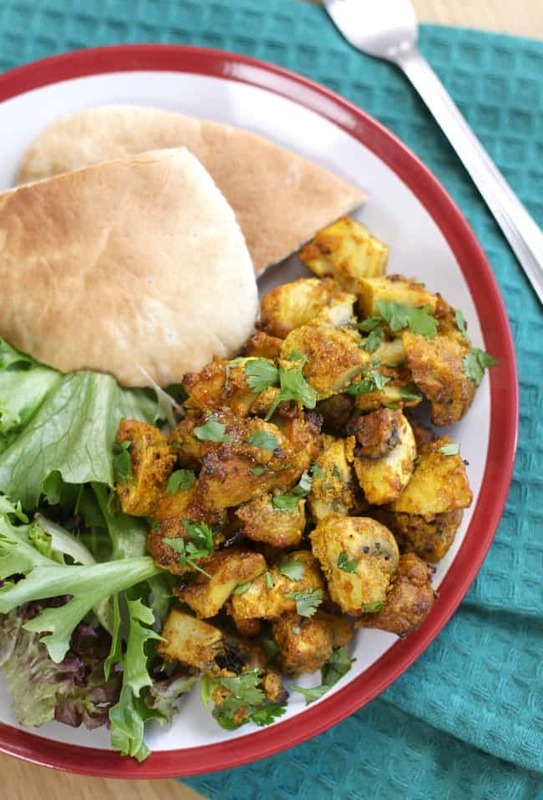 Now – are these tikka mushrooms authentic? Almost certainly not – unless I’ve become a master of Indian cooking overnight with absolutely no effort (which I think is probably fairly unlikely). But, what they are is a really easy recipe that can be made with only a few minutes of effort. Just leave the mushrooms to marinate for a little while, then stick them in the oven, and you’re done. 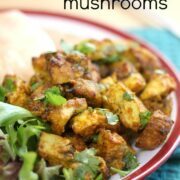 My favourite thing about these tikka mushrooms is how versatile they are! As you can see, I served them for lunch with some salad and a suitably inauthentic pitta bread (naan would have been much better). But, they’d also be great as a canapé (on cocktail sticks, of course), or as a side dish alongside an Indian curry feast. I used big mushrooms and chopped them into chunks, but using some little button mushrooms whole would be good too. Feel free to adjust the spices depending on your personal preferences, by the way. Add more chilli powder if you like things really hot, or less if you’d prefer a milder flavour. Oh, and I would definitely recommend doubling or tripling the recipe. As written, it will only serve one (or two if you’re a bit stingy), and believe me you’ll be wishing you made more. In a large bowl, combine the yogurt with the oil, lemon juice and spices. Season generously and mix well. Add the diced mushrooms, and mix until they’re completely coated in the yogurt mixture. Leave to marinate for at least 20 minutes. Heat the oven to 180°C (Gas Mark 4 / 350°F). Lightly grease a baking tray, and spread the mushrooms out in a single layer. Roast for around 25 minutes, until the mushrooms are soft. 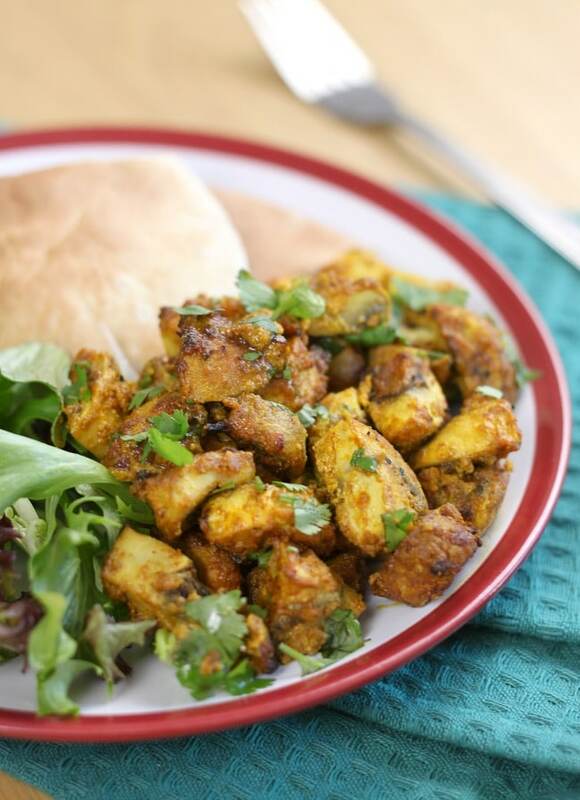 Serve warm with the fresh coriander. I love mushrooms very much. You’re killin’ me today. I absolutely love mushrooms so will have to try to make these. Just made them, they were pretty good but the turmeric flavor was a bit overpowering and it seemed a lot drier than yours? Made these with out the chili powder, so good. Now I want to do a big mix with tofu, potato, and cauliflower as well as the mushrooms. Mmmmmm, that looks EXTREMELY tasty. Becca, these sound so great, I love mushrooms, and have pretty much all the ingredients (except the shrooms) already in my pantry. I have made yogurt marinated chicken, that I roast leaving the yougrt clinging, so I know what you mean about the crust factor. Thanks for this great idea. Wonderful!! made them for dinner last night with tofu in place of some of the mushrooms. My husband adored it. will be making it again! 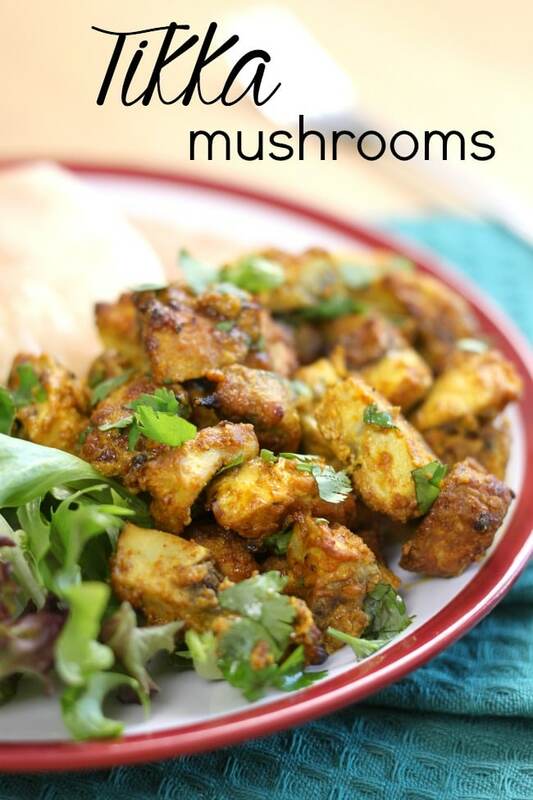 Mushrooms with tikka flavourings, such a great idea. I am doing this! These look fantastic Becca, I’m pleased that you got past your initial reservations! Being a food blogger is good for stretching food boundaries isn’t it?! Yum! This sounds delicious. We always bake with yoghurt in this way – I really like the texture of cooked yoghurt. I made this last night for dinner, it was really good! I tripled the recipe (although probably got my proportions a bit wrong haha) and also made another bowl using the same marinade/sauce with diced chicken for the meat-eater in the house. He said it was really good (I’ll take his word for it), but he also loved the mushrooms! He only took a little bit of the mushroom mix at the start, but after one bite he went back and piled his plate right up! Haha. Served it with rice and some roti, and a little bit of greek yoghurt on the side. It was surprisingly filling! Haha I’m glad even the carnivore enjoyed them!! :) sounds like an awesome meal! I wouldn’t mind if they weren’t authentic, they look really tasty to me! I absolutely love the sound of these – they seem like they’d be really low calorie too – so I could actually eat them right now! Yum! I am with you on cooking things that you are not sure you like. But that is the way to find new things that you do end up loving. Oh wow I have to give these a go – delicious! I love mushrooms, but sadly my other half doesn’t. Perhaps these could tempt him though. They sound delicious. Becca… loving this recipe!!! The flavor sounds incredible! I bought some Portobello mushrooms today; I think this might well be tomorrow night’s supper! I think I’ve all the ingredients we need….. I made them. They were okay, but I didn’t find them in the least crispy, more soggy! They tasted okay, but not the best thing ever… Glad I tried them, though. I don’t think this recipe sounds strange at all…it just sounds yummy! I could happily eat mushrooms every day and I love Indian food. A perfect combination. Ho.lee. Cats. I think I love you, Becca. they look lovely Becca – I do like anything marinated in yoghurt! delicious. Great combination of flavors. I enjoy these flavors with vegetables and mushrooms. These look lovely! Are they spicy hot? We are sissies in my household….we don’t do hot…lol! Also I am thinking any kind of mushrooms would work….I am going to use Portobello. I didn’t think they were hot at all! Just nicely flavoured :) but feel free to adjust the recipe as you see fit! Oh and yes I’m sure portobellos would work just fine! These mushrooms sound FANTASTIC! I think I’m going to try this with eggplant. 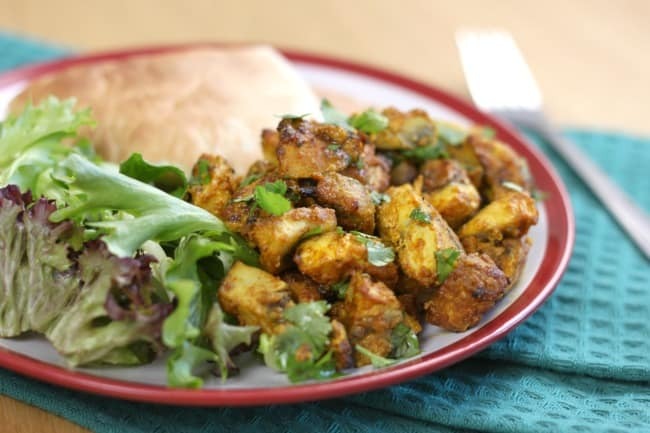 I am not a lover of mushrooms but your dish looks very tasty and I do love Indian spices. So I am going to try this dish and share with Veggie daughter, who lives next door, and who loves mushrooms of any kind. Again, looks like a winner. I know I would adore these. 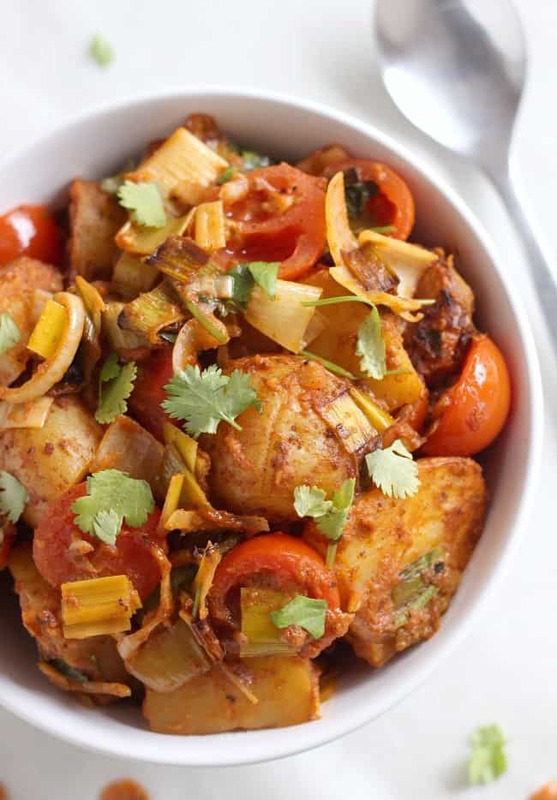 Mushrooms and Indian spicing. Perfect. My husband loves mushrooms… And I love trying new recipes out for him! This may be a good one for him!